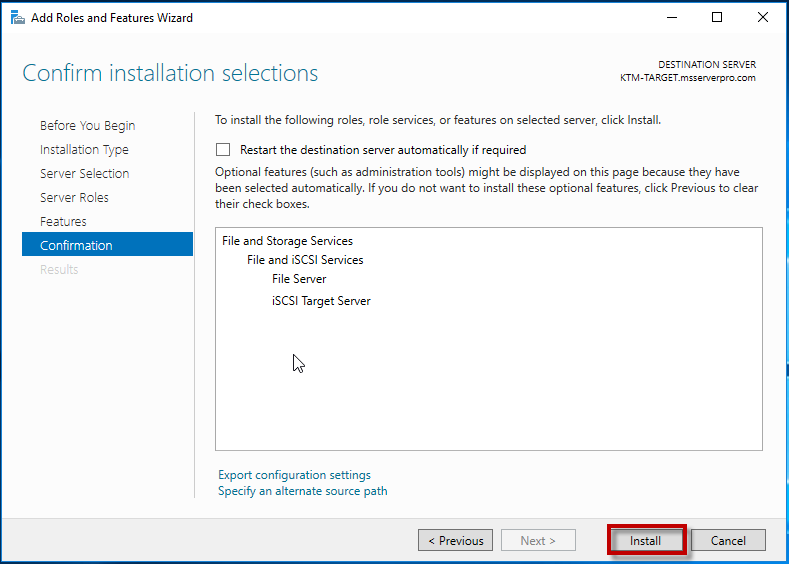 You can install iSCSI Target Server role using either Server Manager or Windows PowerShell. 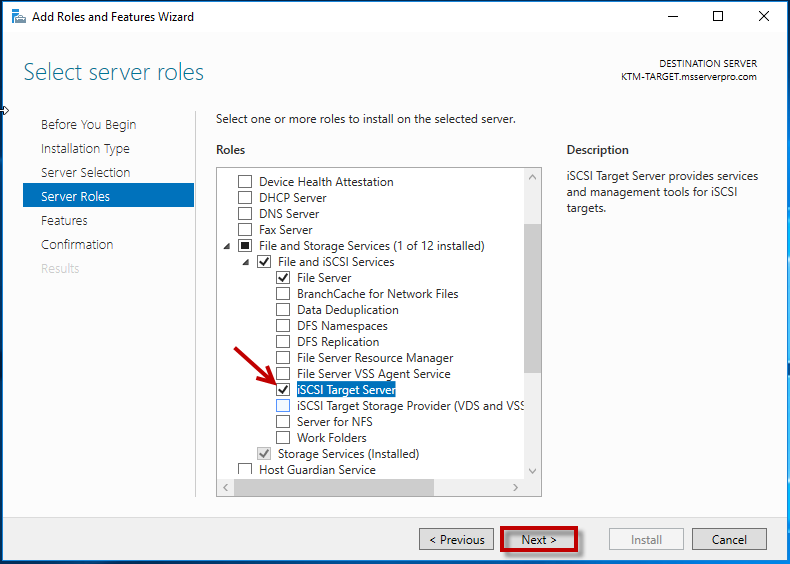 Here, you are installing iSCSI Target Server role using Server Manager. 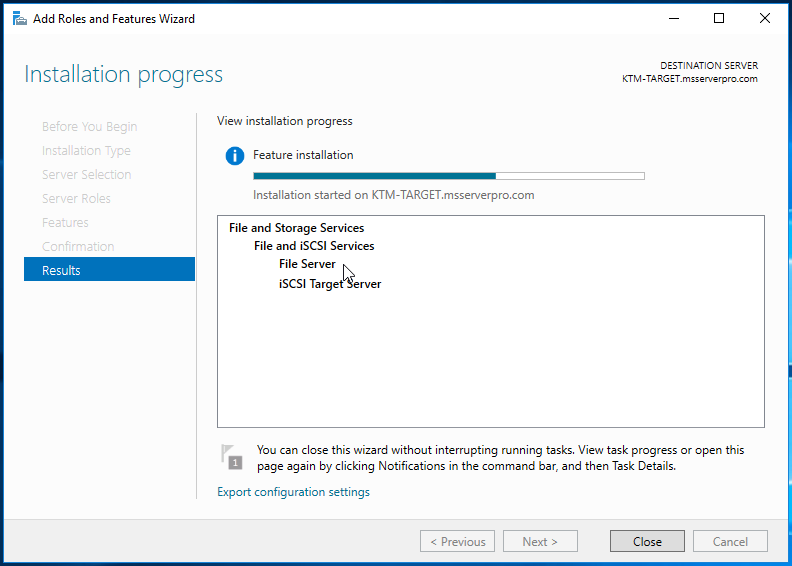 Here, you are installing iSCSI Target Server role on KTM-TARGET server. 1. On KTM-TARGET, in Server Manager, click on Manage, and select Add Roles and Features. 2. 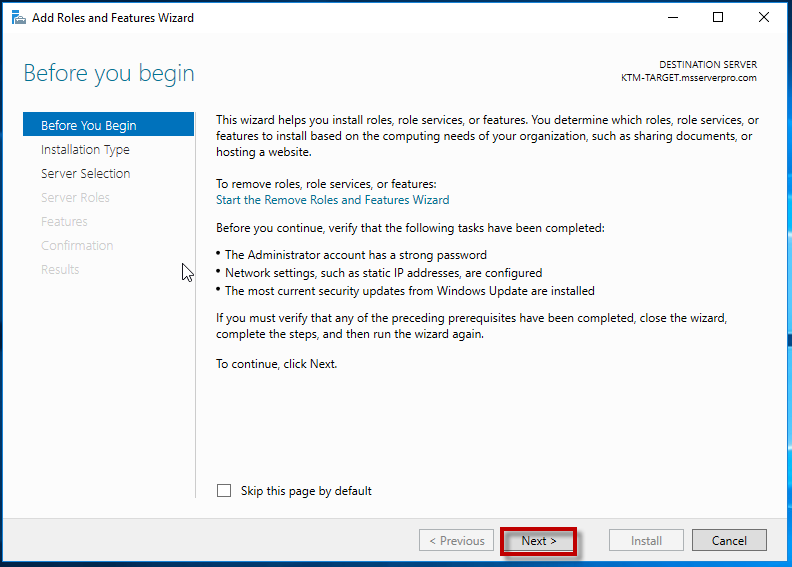 In the Add roles and Features Wizard, on the Before to Begin page, click Next. 3. 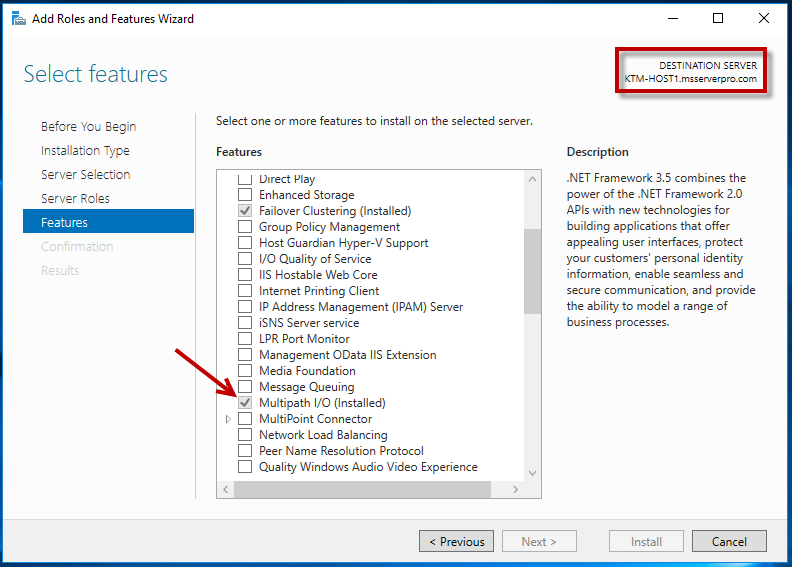 On the Select Installation type page, accept the default and click on Next. 4. 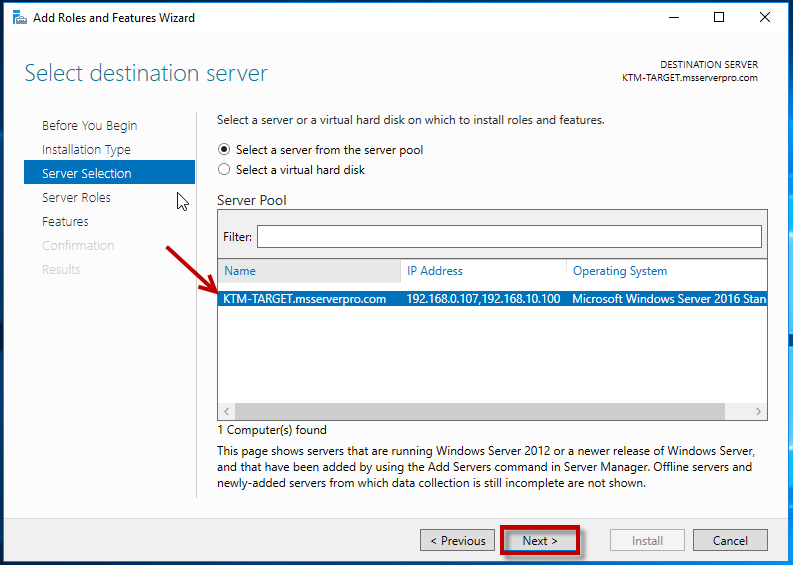 On the Select destination Server page, ensure that Select server from the server pool is selected. 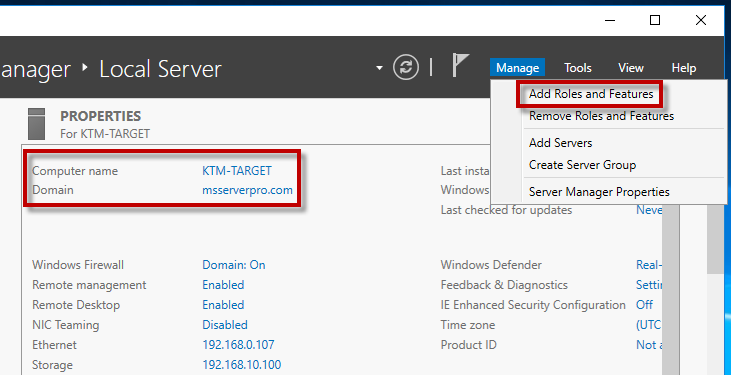 In the Server Pool KTM-TARGET is highlighted and click on Next. 5. 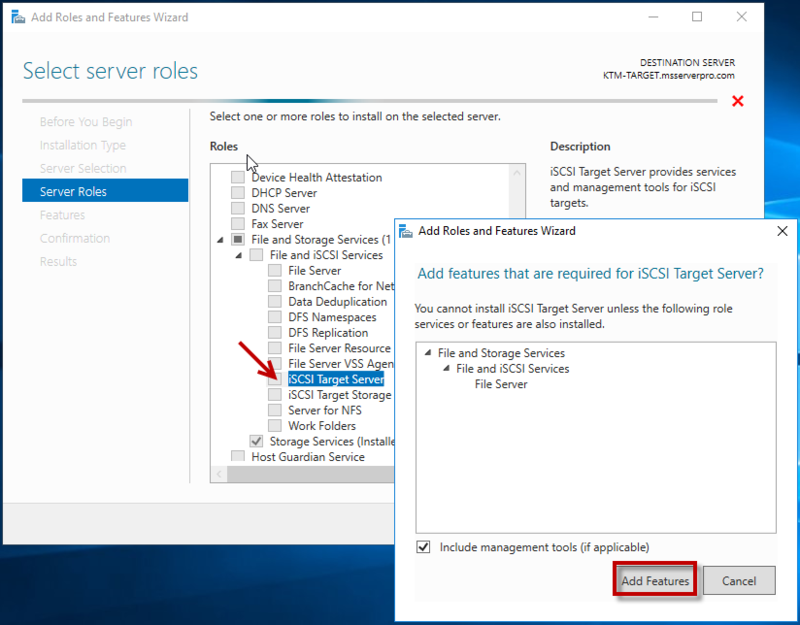 On the Select Server roles page, expand the File and Storage Services | File and iSCSI Services and select iSCSI Target Server check box. 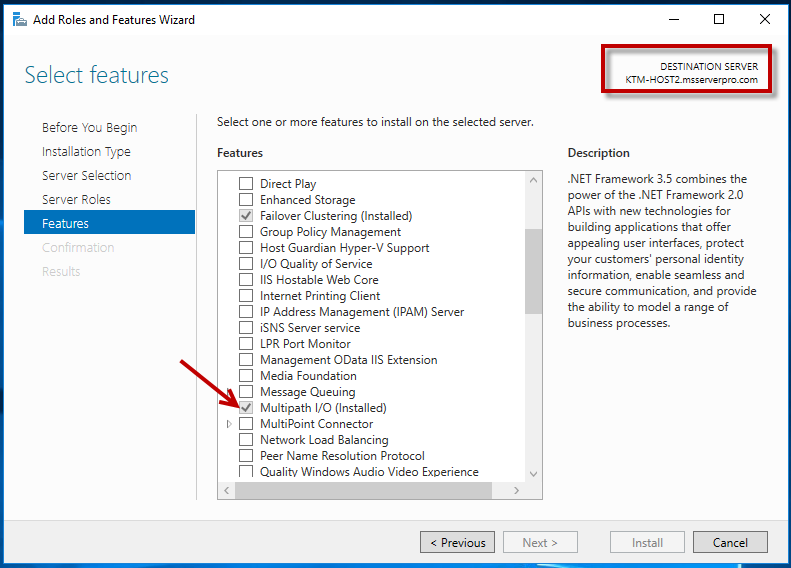 On the Add Roles and Features Wizard window, click on Add Features. Then click on Next. 6. On the Select Features page, click on Next. 8. 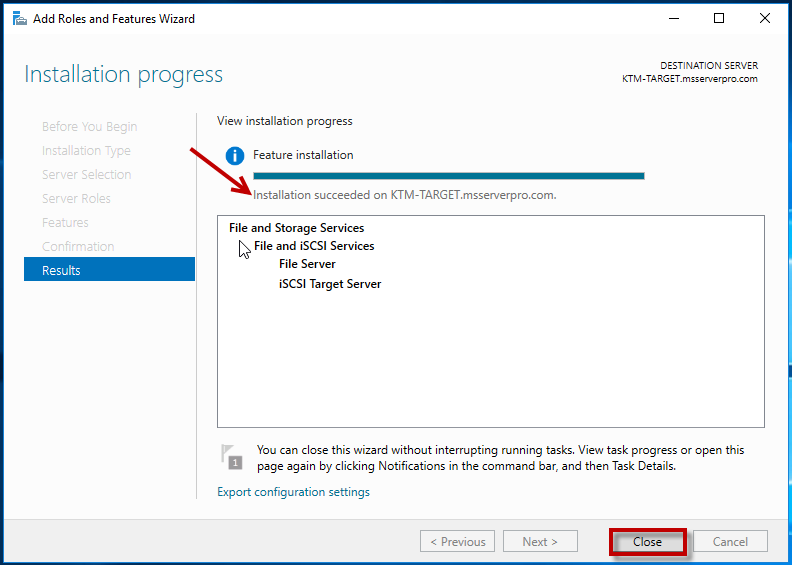 Verify the feature Installation progress succeeded and click on Close. 1. 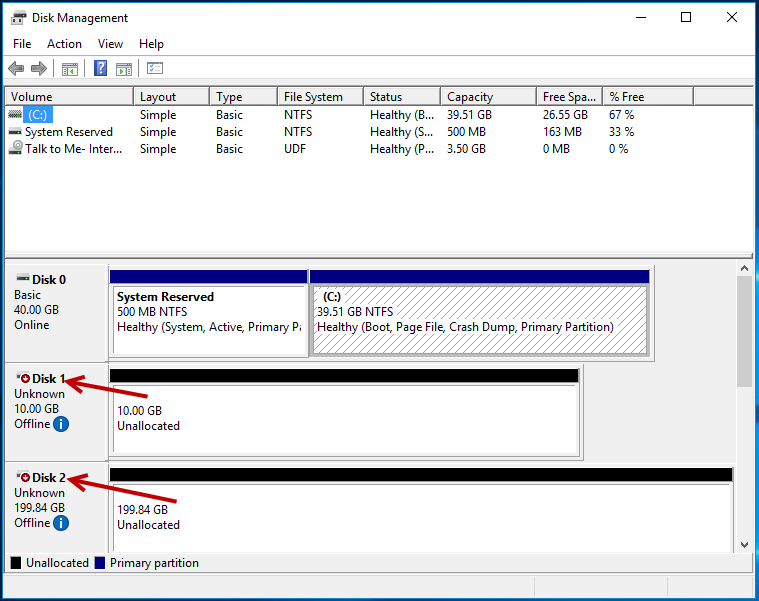 On KTM-TARGET, in the Server Manager, in the navigation pane, click File and Storage Services. 2. 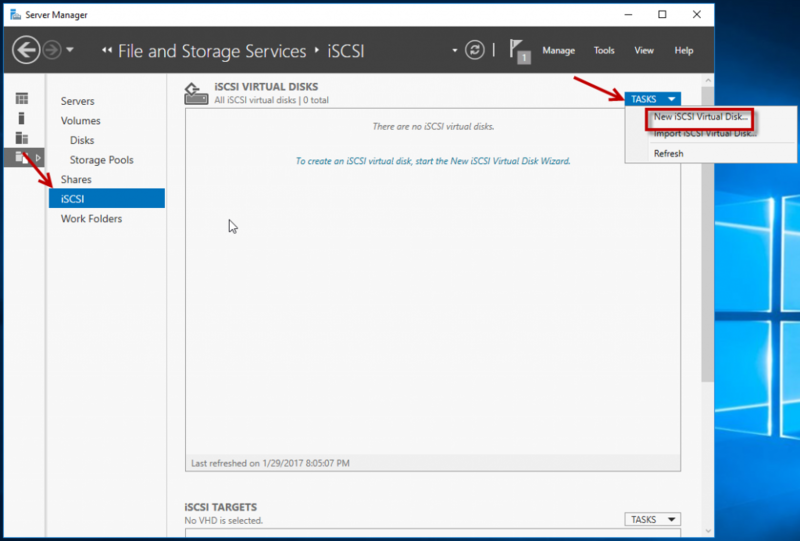 In the File and Storage Services pane, click iSCSI. 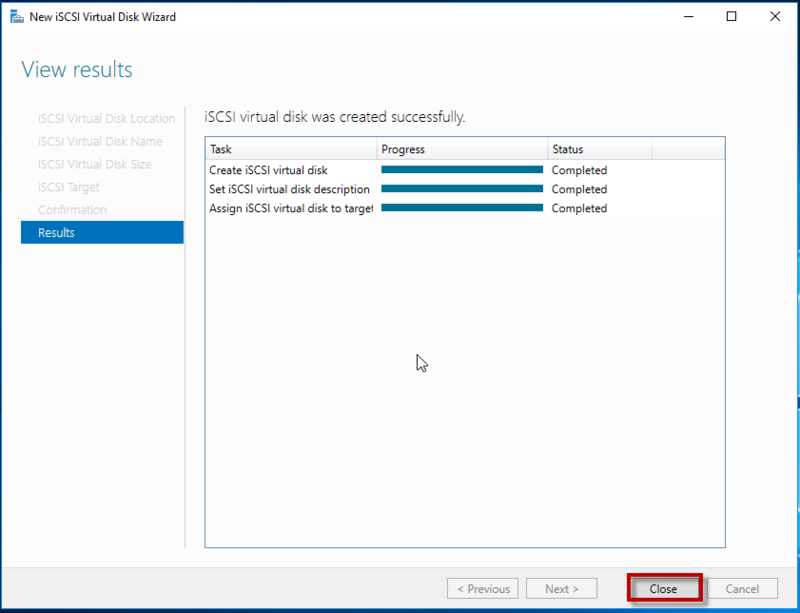 In the iSCSI VIRTUAL DISKS pane, click TASKS, and then click New iSCSI Virtual Disk. 3. 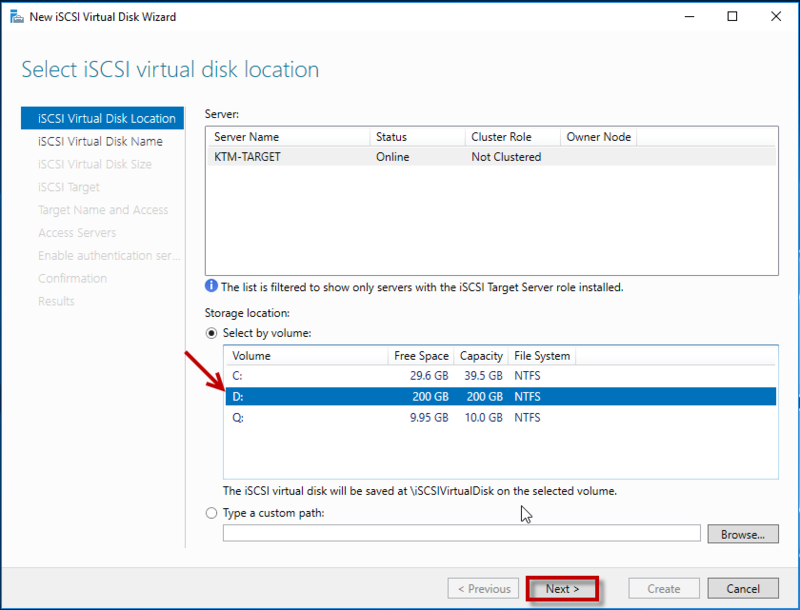 In the New iSCSI Virtual Disk Wizard, on the Select iSCSI virtual disk location page, under Storage location, click volume Q:, and then click Next. 4. 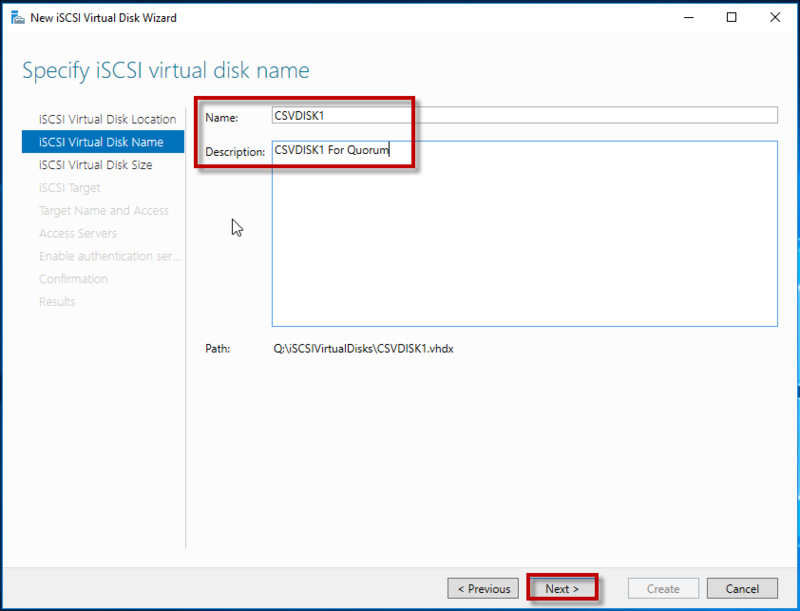 On the Specify iSCSI virtual disk name page, in the Name text box, type CSVDISK1, and then click Next. 5. 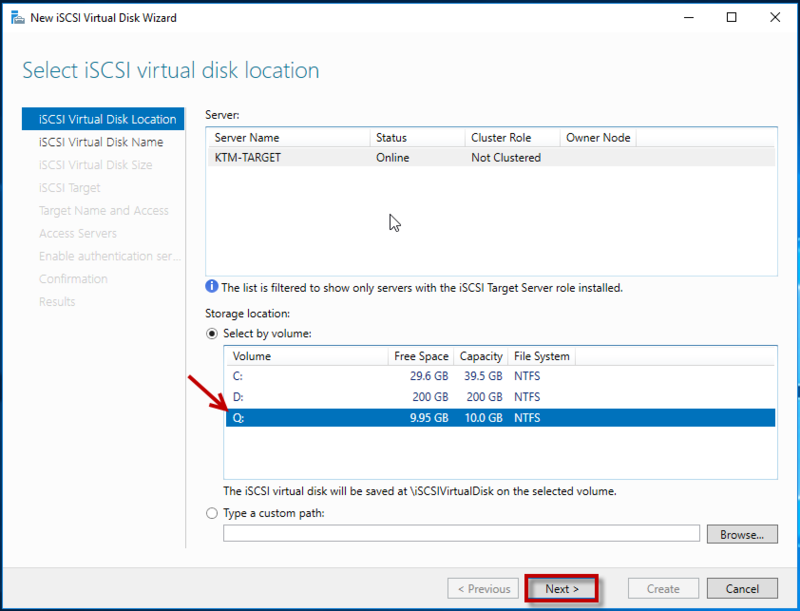 On the Specify Iscsi virtual disk size page, in the Size text box, type 10, ensure that GB is selected, and then click Next. 6. 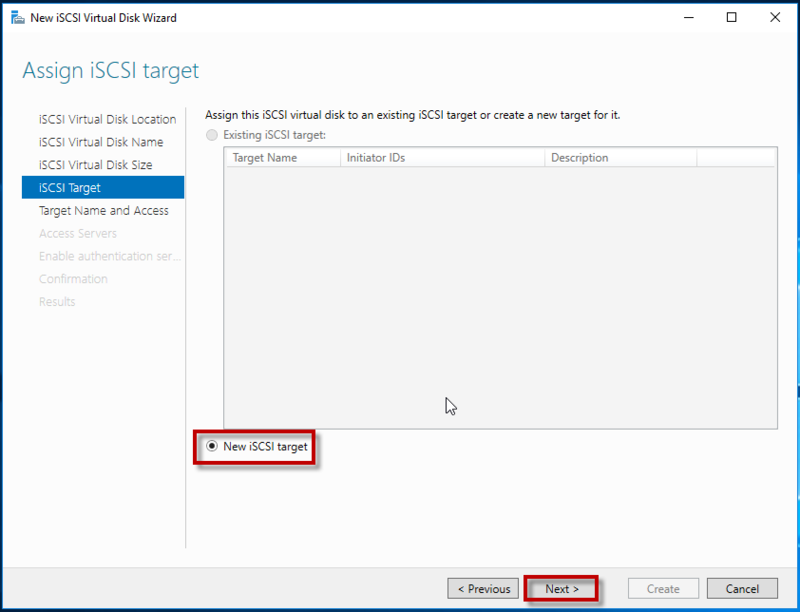 On the Assign Iscsi target page, ensure that the New Iscsi target radio button is selected, and then click Next. 7. 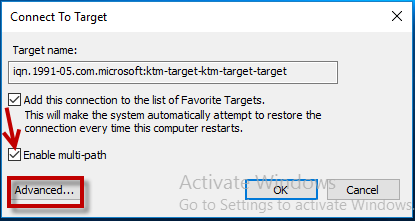 On the Specify target name page, in the Name box, type KTM-TARGET, and then click Next. 8. 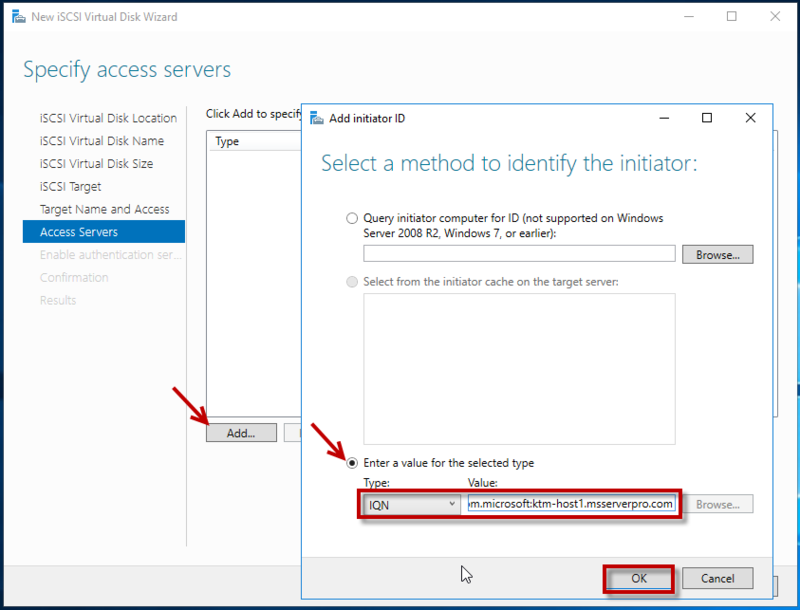 On the Specify access servers page, click Add. 9. 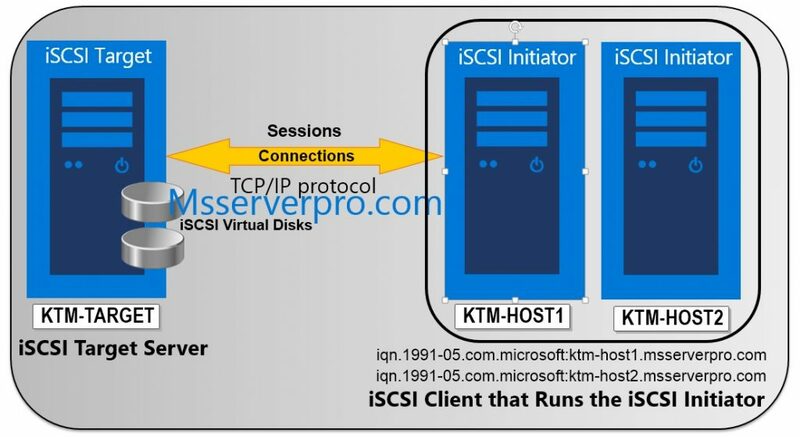 Log On KTM –HOST1, In the Server Manager, on the menu bar, click Tools, and then, in the Tools list, click iSCSI Initiator. 10. 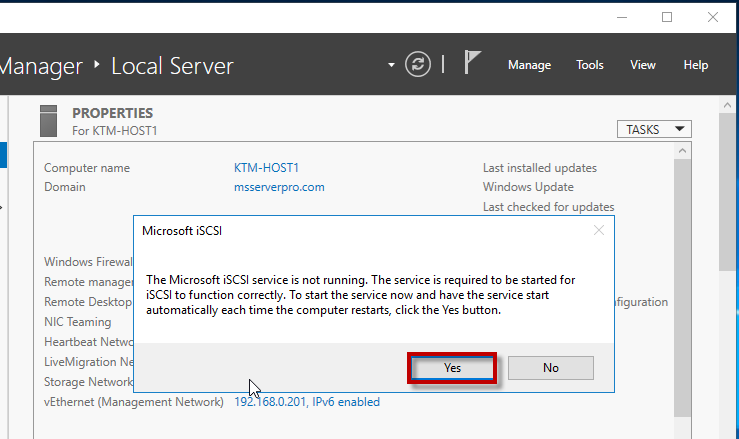 In the Microsoft iSCSI dialog box, click Yes. 11. 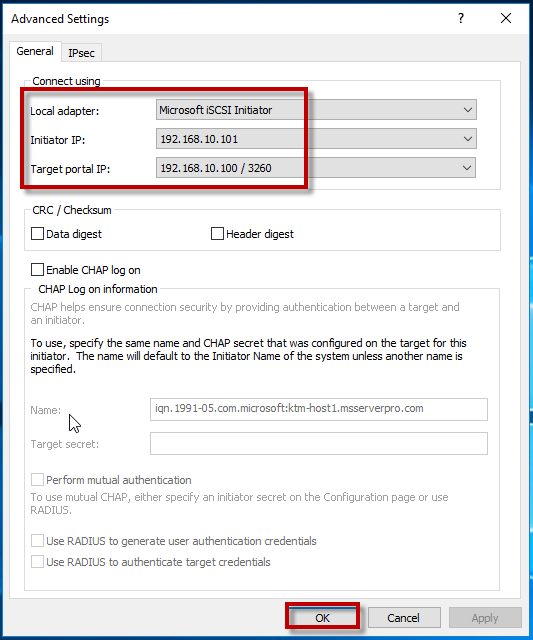 In the iSCSI Initiator Properties dialog box, on the Configuration tab, in the Initiator Name: copy the iSCSI qualified name (IQN). 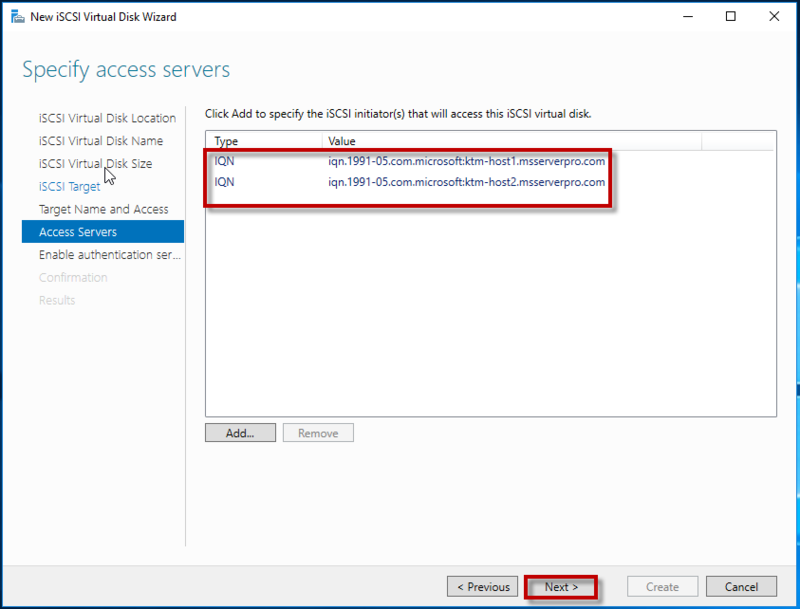 Switch to KTM-HOST2, in the iSCSI Initiator Properties dialog box, on the Configuration tab, in the Initiator Name: copy the iSCSI qualified name (IQN). 12. 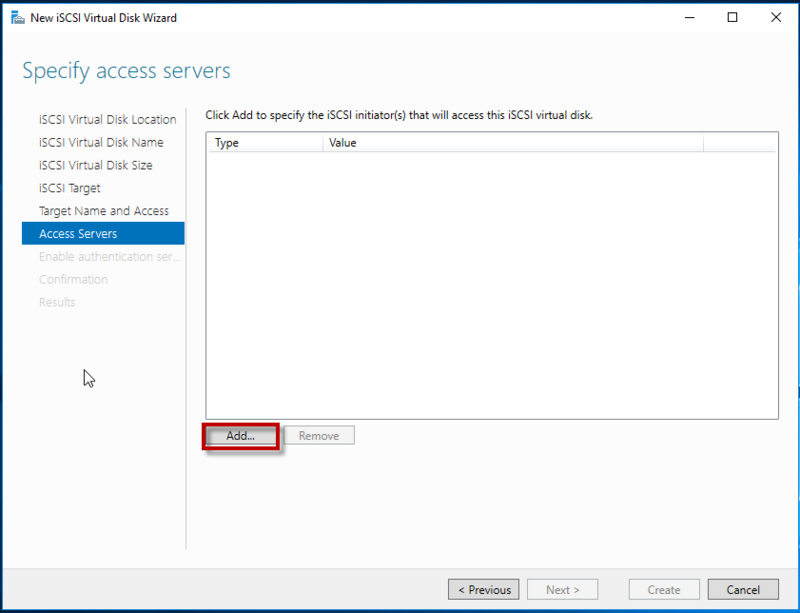 On the Specify access servers page, click Add. 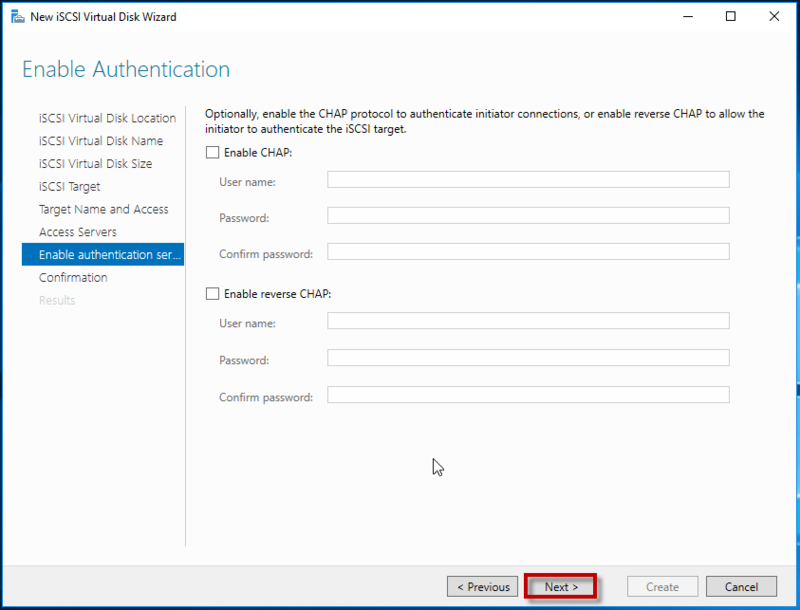 In the Select a method to identify the initiator dialog box, click Enter a value for the selected type, in the Type list, click IQN, in the Value text box, type KTM-HOST1 iSCSI qualified name (IQN) and click OK.
13. 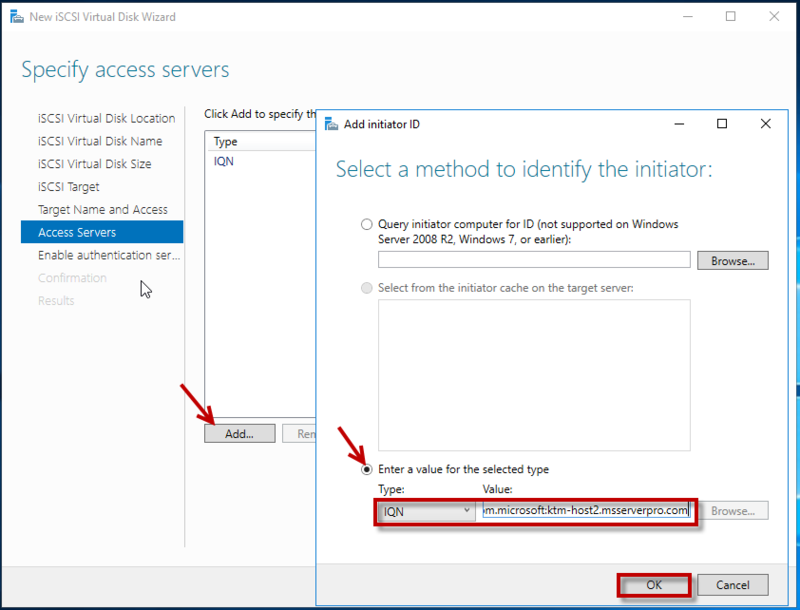 On the Specify access server page, click In the Select a method to identify the initiator dialog box, click Enter a value for the selected type, in the Type list, click IQN, in the Value text box, type KTM-HOST2 iSCSI qualified name (IQN) and click OK.
14. 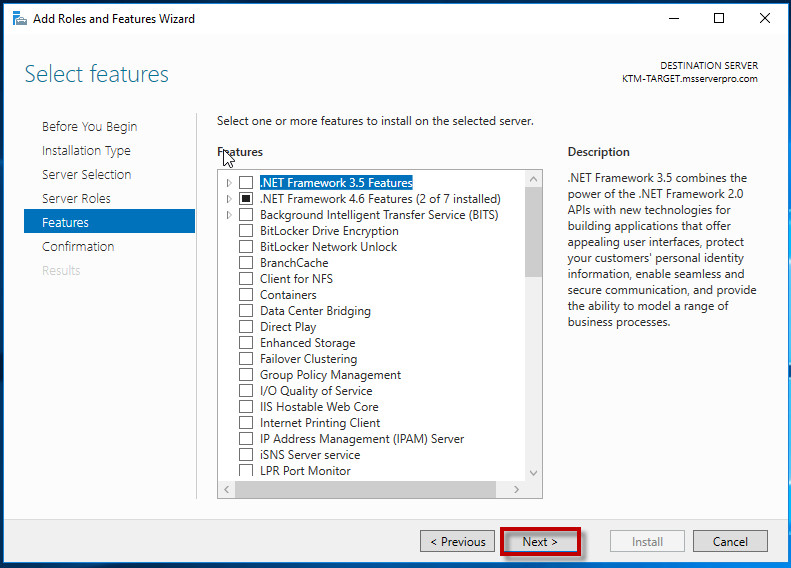 On the Specify access servers page, click Next. 15. On the Enable Authentication page, click Next. 16. On the Confirm selection page, click Next. 17. 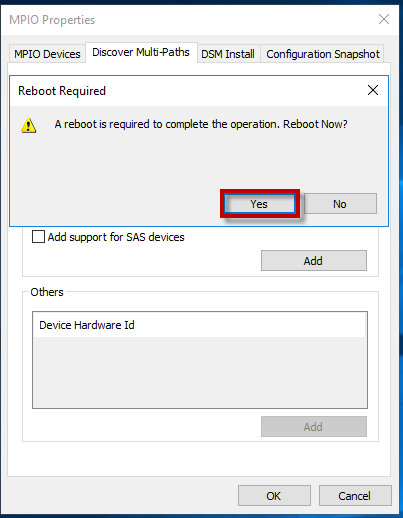 On the View results page, wait until the virtual disk is created and then click Close. 18. 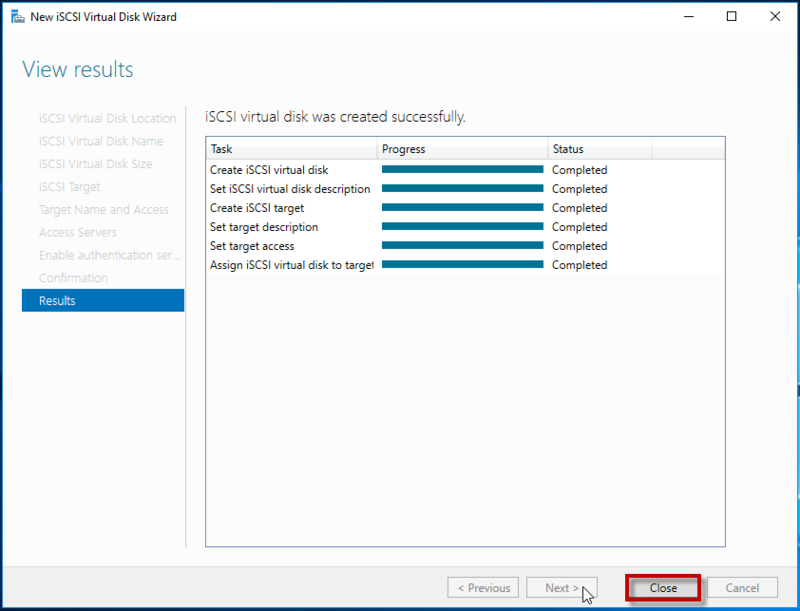 On the iSCSI VIRTUAL DISKS pane, click TASKS, and then click New iSCSI Virtual Disk. 19. 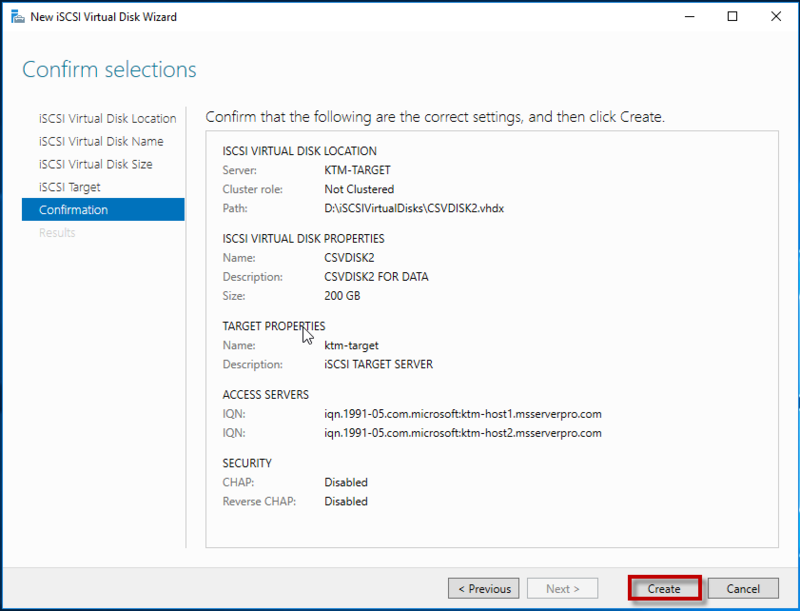 In the New iSCSI Virtual Disk Wizard, on the Select iSCSI virtual disk location page, under Storage location, click volume D, and then click Next. 20. 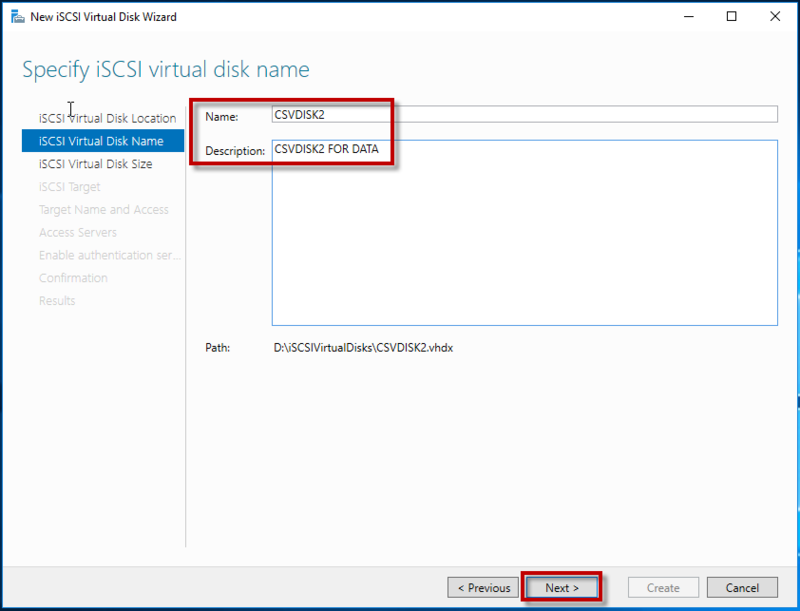 On the Specify iSCSI virtual disk name page, in the Name box, type CSVDISK2, and then click Next. 21. 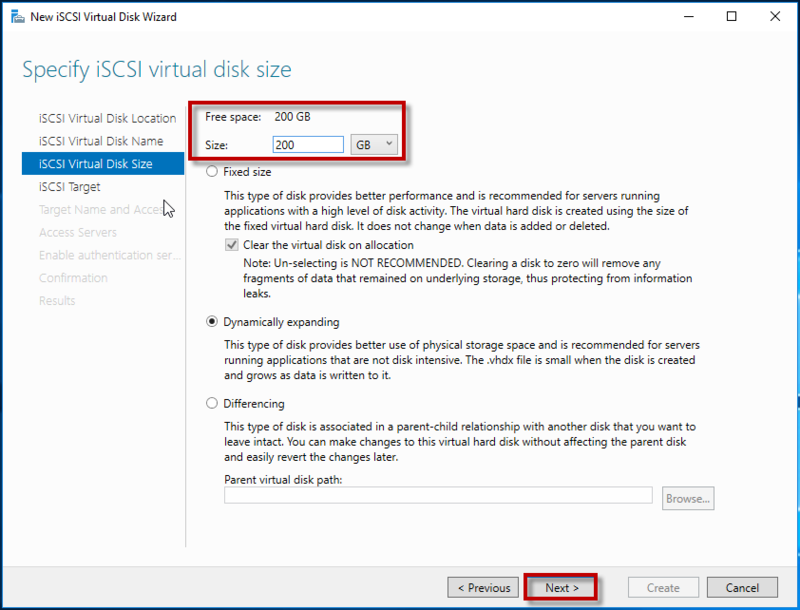 On the Specify iSCSI virtual disk size page, in the Size box, type 200, ensure that GB is selected, and then click Next. 22. On the Assign iSCSI target page, select Existing iSCSI target, under Target Name verify KTM-TARGET, and then click Next. 23. On the Confirm selections page, click Create. 24. 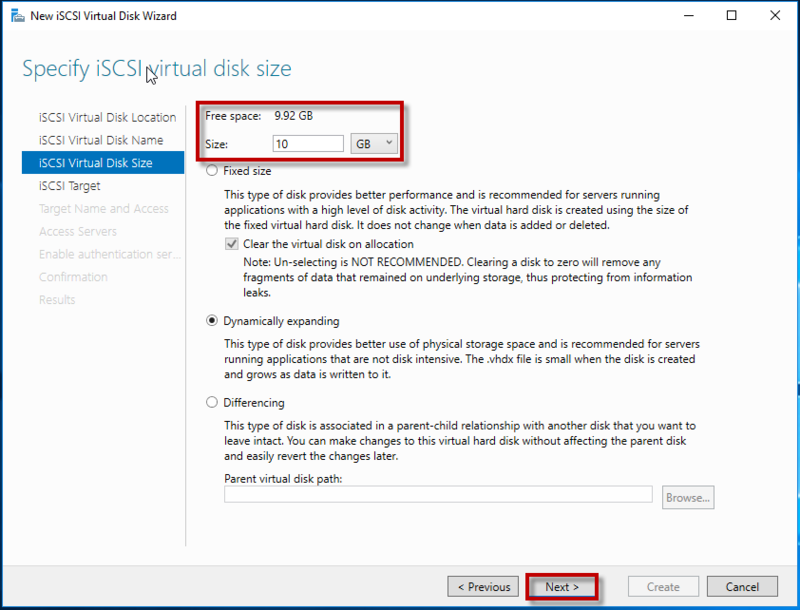 On the View results page, wait until the virtual disk is created, and then click Close. 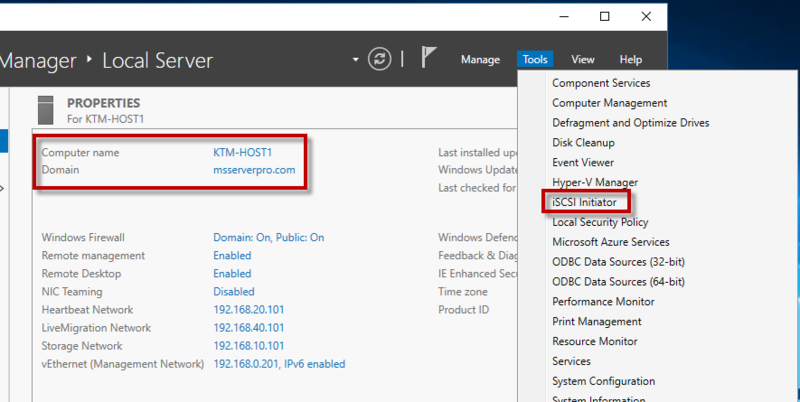 Log on to Hyper-V Hosts (KTM-HOST1 & KTM-HOST2), in Server Manager, add the Multipath I/O features. 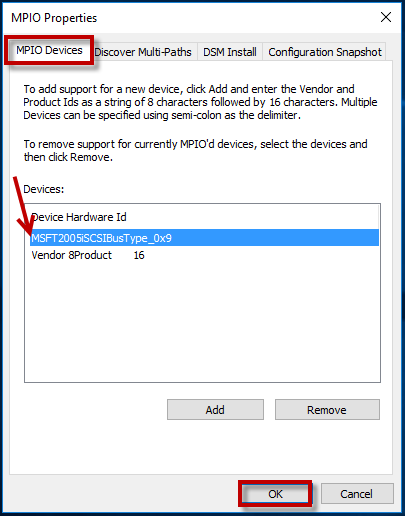 After the computer restarts, in Server Manager, on the Tools menu, click MPIO, and then verity that Device Hardware ID MSFT2005iSCSIBusType_0x9 is added to the list. 1. 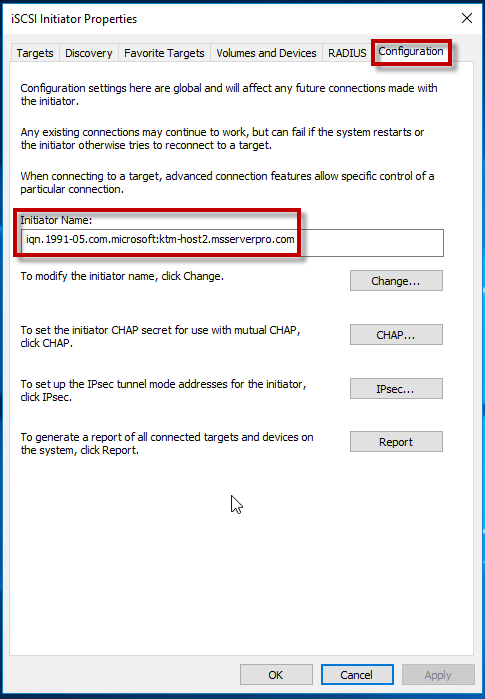 On the KTM-HOST1, in Server Manager, click Tools and then click iSCSI Initiator. 2. 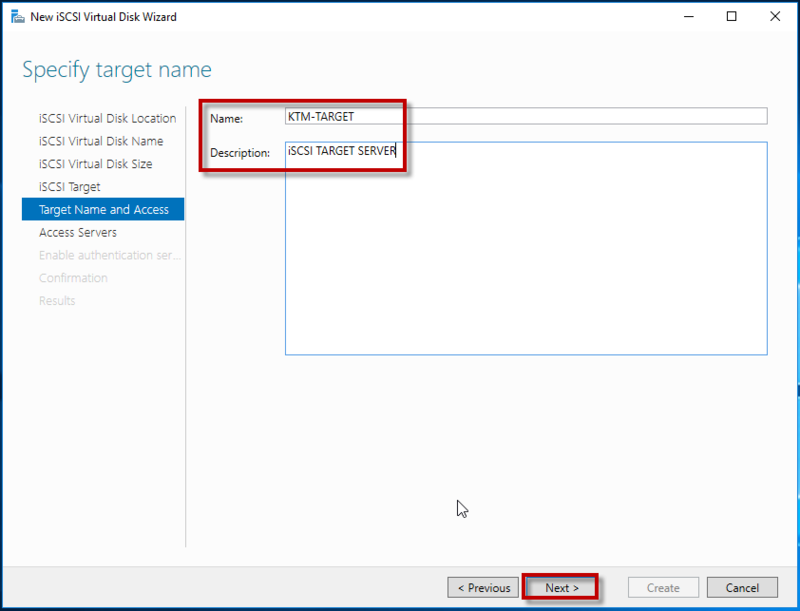 In the iSCSI Initiator Properties dialog box, on the Target tab, click Quick Connect..
3. 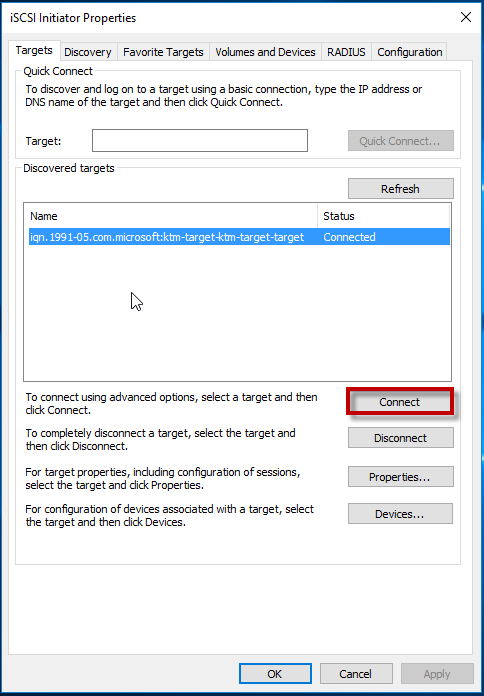 On the Quick Connect dialog box, verified Discovered targets status is Connected and click on Done. 4. 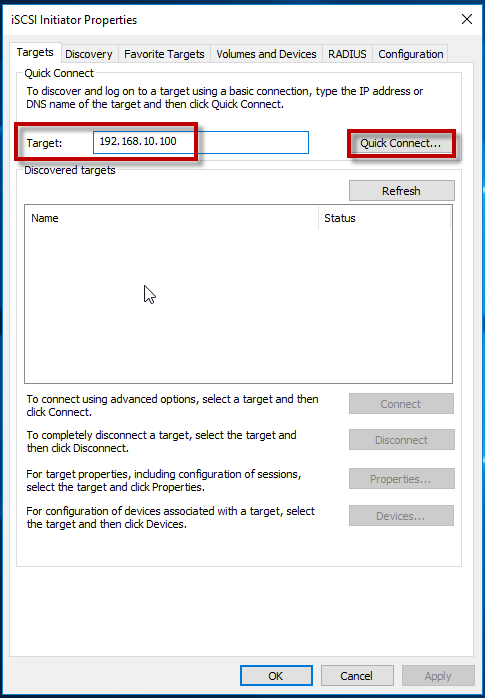 In the iSCSI Initiator Properties dialog box, on the Targets tab, click Connect. 5. 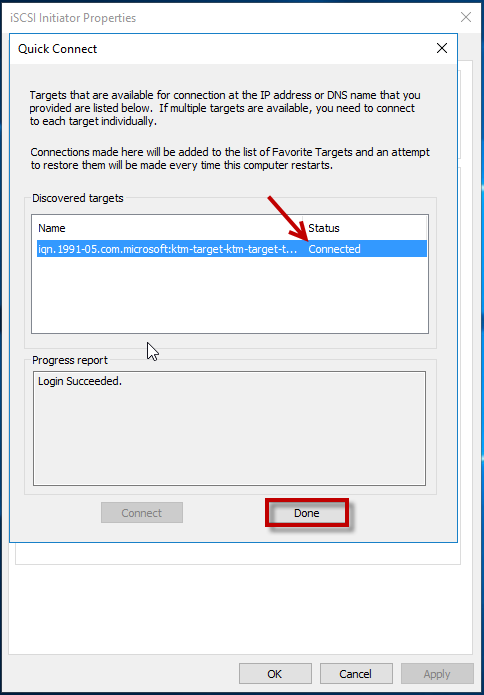 In the Connect to Target dialog box, click Enable multi-path, verify that the Add this connection to the list of Favorite Targets check box is selected, and then click Advanced. 6. 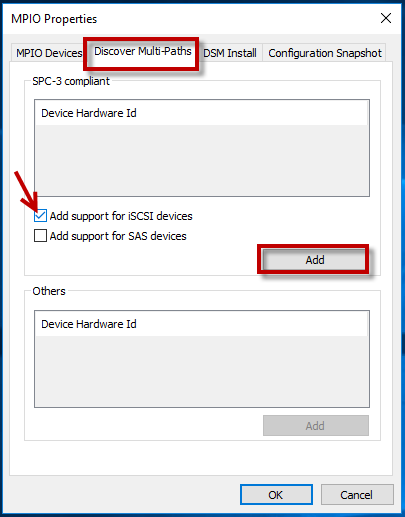 In the Advanced Settings dialog box, on the General tab, change the Local Adapter from Default to Microsoft iSCSI Initiator. 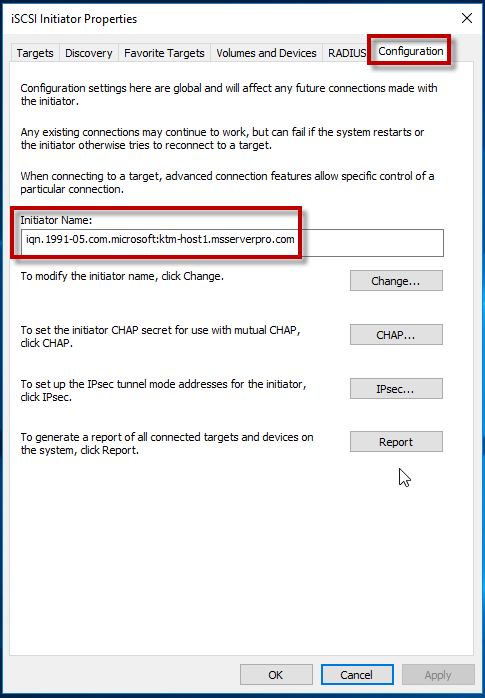 In the Initiator IP list, click 192.168.10.101, and in the Target Portal IP list, click 192.168.10.100/3260. Then Click OK.
7. 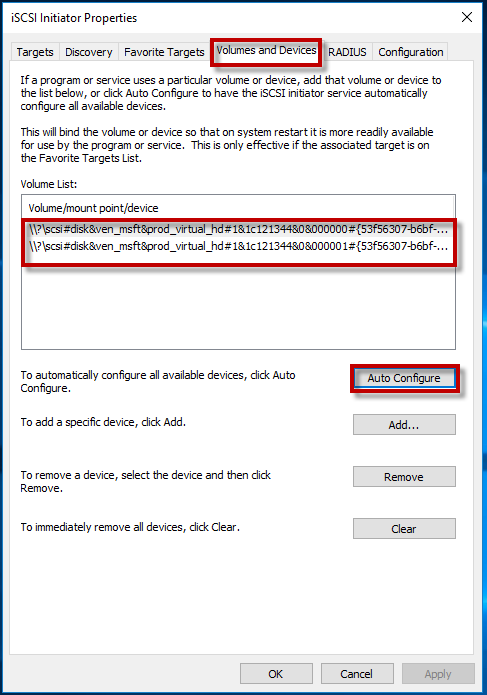 In the iSCSI Initiator Properties dialog box, on the Volumes and Devices tab, click Auto Configure. 8. 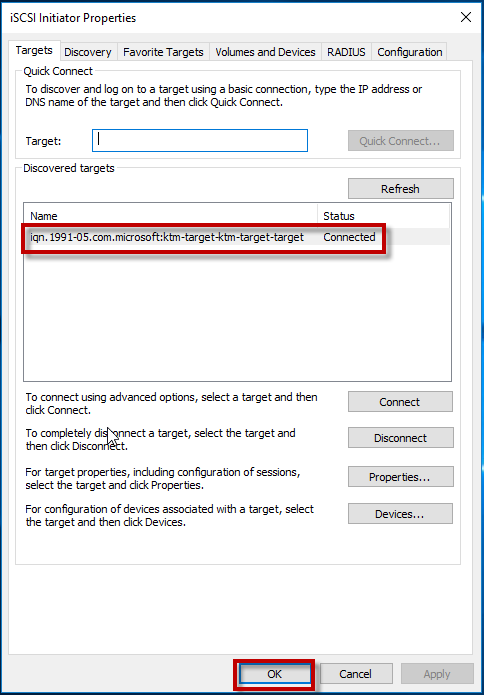 In the iSCSI Initiator Properties dialog box, on the Targets tab, Discovered targets status is Connected and click OK.
Do the same on KTM-HOST2. 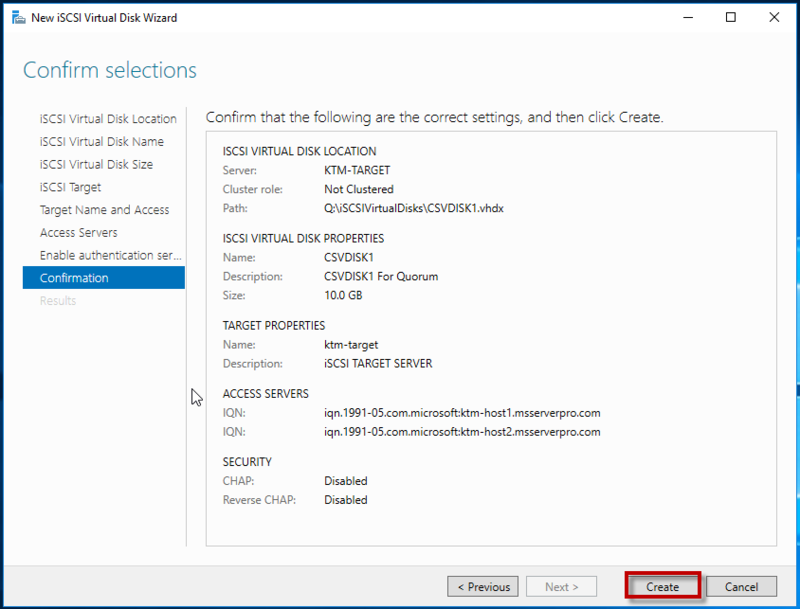 After connected to iSCSI virtual disk, log on to the KTM-TARGET, Open the Disk Management verify that iSCSI virtual Disks are listed as given below. 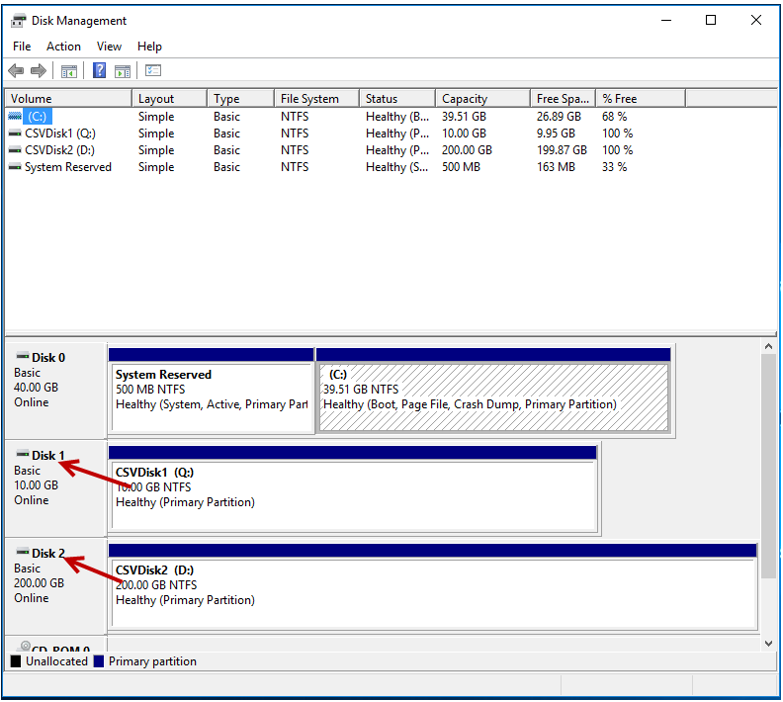 Right-click on the new disks and click on Online. 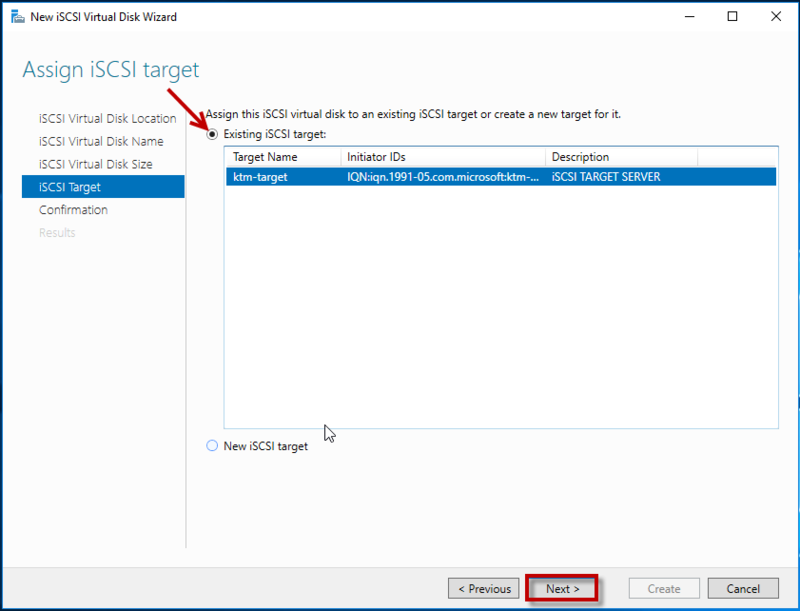 You have installed the iSCSI Target Server features, configured iSCSI targets, installed and configure Multipath I/O feature, connected to the iSCSI targets and initialized the iSCSI disks. 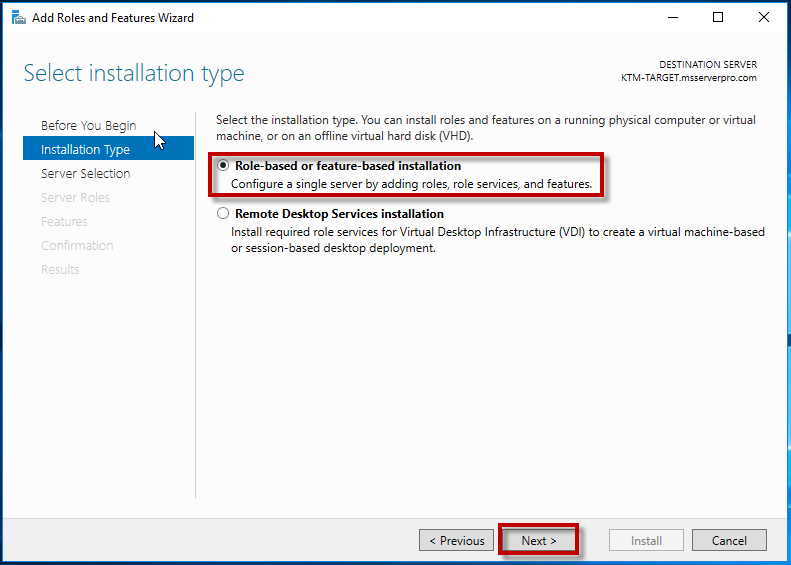 I hope this article will help to install and configure Windows Server 2016 server as an iSCSI Storage and initiator in Windows Server 2016.